Kim Hunter is an Academy Award and Golden Globe winning actress. She won a Daytime Emmy for The Edge of Night. 09/09/1974 0145 Double Exposure A cop dies in an accident. His wife is mistakenly taken to be someone else by two people. Her friend tries to probe the facts as one of those people thinks that she is his former wife who left him and his children a decade ago. 11/07/1975 0375 Killing Valley In order to exact revenge against the people that ruined her father's life, a famous writer goes back to the place of her birth to dig up dirt on the town and its people. As she goes along, she is surprised to discover things that she never knew about her parents. 12/18/1975 0398 Fireball When strange things start happening around the newly hired blacksmith, a military contractor's wife begins to suspect that he is the incarnation of the fire god, Vulcan. Her husband is inclined to believe her when he is suddenly crippled by a freak accident. 03/28/1979 0966 Waste Paper During an investigation into the brutal killing of a cleaning woman in a commercial complex, a lady detective discovers that the deceased was actually living a double-life. 05/04/1981 1193 Garden of the Moon After purchasing make-up at a new health store, a young executive develops a sudden taste for moon bathing. She is soon invited to a free convention for all the others that have fallen prey to their scam. Don't forget, she was Zera in the Planet of the Apes! She appeared in 23 episodes. Many of us first got to know her as Zira. She won an Oscar for playing Stella opposite Marlon Brando's Stanley in "A Streetcar Named Desire" - don't forget that, either. 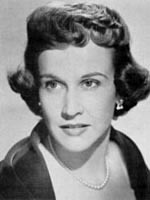 Kim Hunter (born Janet Cole, November 12, 1922 – September 11, 2002) was an American film, theatre, and television actress. She still appeared in an episode of CBS's anthology series Appointment with Adventure and NBC's Justice, based on case files of the New York Legal Aid Society. [ She co-starred in Rod Serling's Peabody Award-winning teleplay on Playhouse 90, "Requiem for a Heavyweight". She appeared opposite Mickey Rooney in the 1957 live CBS-TV broadcast of The Comedian, another drama written by Rod Serling and directed by John Frankenheimer. In 1959, she appeared in Rawhide in "Incident of the Misplaced Indians" In 1962, she appeared in the NBC medical drama The Eleventh Hour and Other Lovely Things". In 1963, Hunter appeared as Anita Anson on the ABC medical drama Breaking Point in the episode "Crack in an Image". In 1965, she appeared twice as Emily Field in the NBC TV medical series Dr. Kildare. In 1967, she appeared in the pilot episode of Mannix. She appeared as Ada Halle in the NBC TV Western series Bonanza in the episode "The Price of Salt". She won both an Academy Award and a Golden Globe Award, each as Best Supporting Actress, for her performance as Stella Kowalski in the 1951 film A Streetcar Named Desire. Decades later, she was nominated for a Daytime Emmy Award for her work on the long-running soap opera The Edge of Night. She also portrayed the character of chimpanzee Zira in the first three installments of the original film adaptation Planet of the Apes.